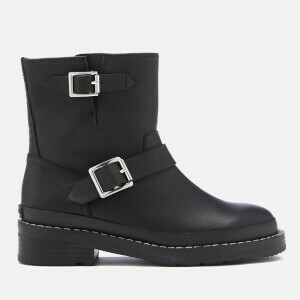 Women's leather biker boots from Hunter. 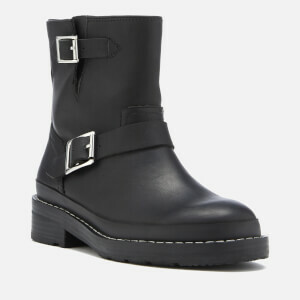 Utilising semi-matte, hydrophobic leather from Terracare (a heritage tannery whose leathers are among the most environmentally-friendly in the world), the 'Original' biker boots are dirt and water-resistant and have been handcrafted to form a rounded toe and tall shaft with two buckle straps to the outside leg. 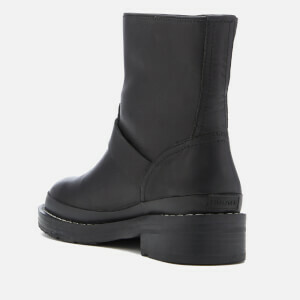 Set upon an original calendered outsole with rubber tread for traction. Unlined. Hunter branding to the heel.